Is it time for a new television? We’ve got a Sinking Fund chart for that! The Television Sinking Fund Chart is here to help you save CASH for that new big screen TV! Imagine my surprise when I heard a friend talking about my big, flat screen television. The thing is 32″ tops! As a matter of fact, many people have commented, ‘now you just need a big screen television’, when visiting our new home for the first time. Even contractors have made the same comment when bidding jobs. Really! Yes, a big screen television is on the list of Stuff We Want but, I have to admit, it ranks way down there with new doorknobs to replace the gold ones that were once so popular. But maybe you’re ready? I just read in the Costco Connection about OLED televisions. They just keep getting better! Gain access to the Television Sinking Fund Chart below! When you print, I suggest using Card Stock for durability. 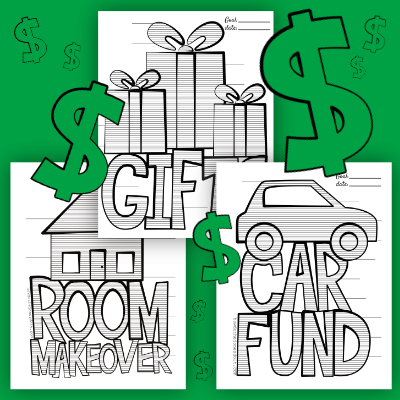 Determine how much you will save for your new television and write it on the Goal line. Record the date you plan to purchase your new television. Divide your saving goal by 10. Write each increment on the lines shooting off the graphic with the smallest on the bottom. If you plan to save $2,000, you would write $200 on the bottom line, $400 on the next line, etc. As you save, color in the lines! Each increment consists of 10 lines to fill in. If you plan to save $2,000 and each increment represents $200, each line would represent $20. For every $20 you save, color in a line. Make your new television a part of your monthly budget! If you plan to save $2,000 and you want to save it in 10 months, you need to incorporate $200 a month into your spending plan. A big screen television is important to a lot of people. It’s like a sign you’ve really made it in this world. It’s like a trophy you hang above the fireplace that says, WE MADE IT. We’re rolling in the dough! Ha! Picture this … a big screen, trophy television you paid cash for! Oh … and I’ll keep my friend that thinks my 32″ is huge! Gain access to the Television Sinking Fund Chart here!